Hannah Barga takes ball four to give the Lady Tigers a walk-off win over Northmont. Caitlin McEldowney makes a play at shortstop for Versailles in win over Northmont. Faith Huddle scores the winning run in Versailles walk-off win over Lady Thunderbolts. Hanna Barga lines a 2-run homer over the leftfield fence for Versailles in win over Lady Bolts. Hanna Barga watches the ball sail over the leftfield fence to give the Lady Tigers a lead over Northmont. Lady Tigers Lauren Monnin picks up a win in relieve over Northmont. 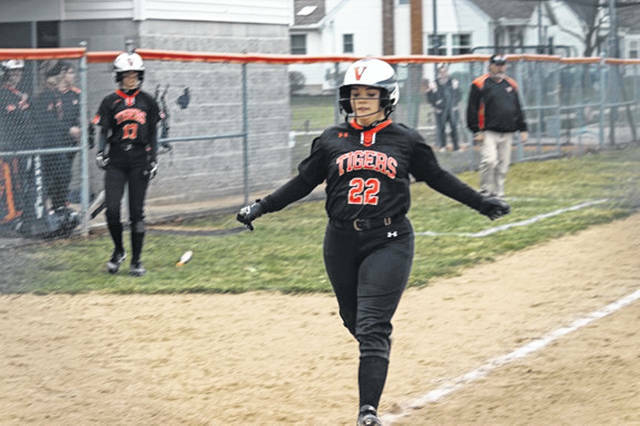 VERSAILLES – The Versailles Lady Tigers battle back to get a 7-6 walk-off win over the visiting Northmont Lady Aviators. With the game tied at 6-6 in the bottom of the seventh, Lauren Monnin coaxed a 2-out walk on a full 3-2 pitch for the dramatic victory. The Lady Bolts dented the plate with two run in the top of the first, added single runs in the second and third innings to lead 4-0 with the Lady Tigers coming to the plate in the bottom of the third inning. Versailles took advantage of a third inning unearned run to plate their first run of the night and used a Caitlin McEldowney RBI double to center to plate the Lady Tigers second run of the inning. Faith Huddle followed with a RBI single to center scoring Makenzie Knore to send the teams to the fourth inning of play with Versailles trailing 4-3. Abby Stammen legged out an infield single to open play in the bottom of the Versailles’ fourth and scored on an Hannah Barga homerun over the left field fence giving the Lady Tigers a 5-4 lead, their first of the night. Northmont answered with a Caskey 2-run homer to center in the top of the fifth to take a 6-5 lead over Versailles. 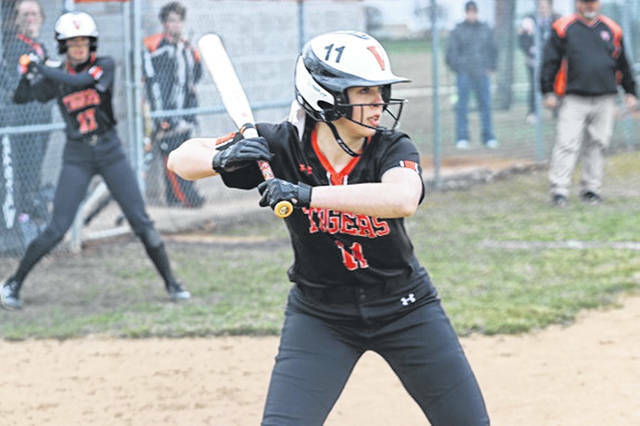 The local girls would not cross the plate in the bottom of the fifth and sixth innings while the Lady Bolts were going quietly in the top of the sixth and seventh innings bringing the Lady Tigers to the plate in the bottom of the seventh trailing by a run. Knore opened with a bunt single down the third baseline followed by a McEldowney sacrifice bunt with Knore moving to second and one down. The speedy Knore quickly stole third and scored on a RBI single to right off the bat of Huddle tying the score at 6-6. Rachel Lyons reached by way of an error putting runners on first and second bringing a pitching change for the Lady Thunderbolts. A Lady Tigers strikeout had Versailles down to its last out and last strike with Stammen at the plate looking at a 2-2 pitch count. Back-to-back walks had Stammen taking a free pass and bringing Monnin to the plate. With Monnin in the box and a 0-1 count with a strike looking, a ball made it 1-1 followed by a foul ball putting Monnin in a hole with a 1-ball 2-strike count. With the disciplined Monnin dug in at the plate, three consecutive balls gave the Lady Tigers a walk-off win with Huddle scoring the winning run. Tara Fritscher started the game for Versailles surrendering six runs on eight hits over 4.2 innings. Monnin was credited with the victory for the Lady Tigers tossing 2.2 innings, allowing two hits and no runs while striking out two and walking one. Huddle went 2-3 with 2-RBIs and a run scored. Barga was 2-4 with 2-RBI’s and a run. McEldowney went 1-3 and a RBI. Knore was 1-3 with 2-runs scored. Stammen went 1-3 with a walk and a run. Monnin had a walk and a run scored and Fritscher scored a run for the Lady Tigers. 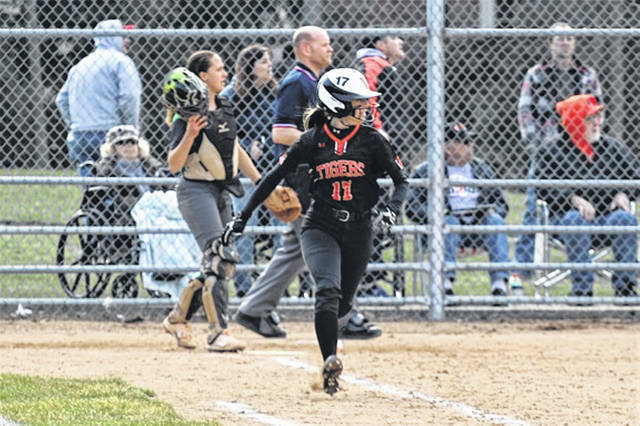 https://www.dailyadvocate.com/wp-content/uploads/sites/34/2019/04/web1_Barga-Walk.jpgHannah Barga takes ball four to give the Lady Tigers a walk-off win over Northmont. 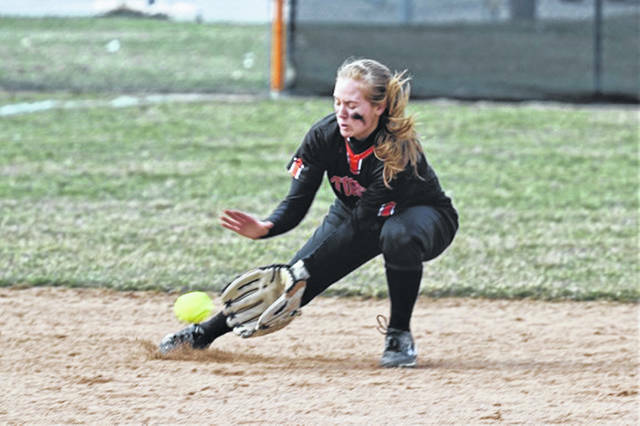 https://www.dailyadvocate.com/wp-content/uploads/sites/34/2019/04/web1_Caitlyn-McEldowney.jpgCaitlin McEldowney makes a play at shortstop for Versailles in win over Northmont. https://www.dailyadvocate.com/wp-content/uploads/sites/34/2019/04/web1_Faith-Huddle.jpgFaith Huddle scores the winning run in Versailles walk-off win over Lady Thunderbolts. 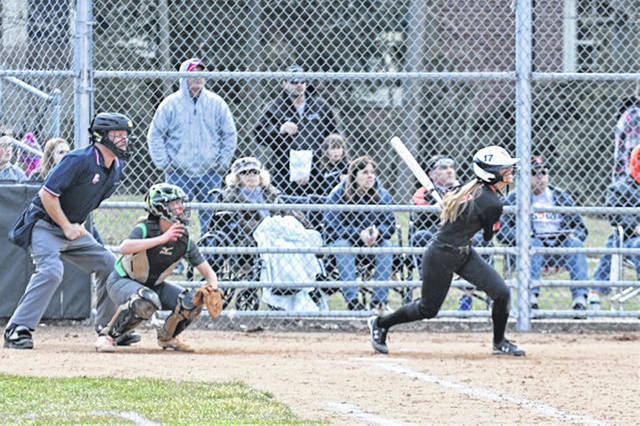 https://www.dailyadvocate.com/wp-content/uploads/sites/34/2019/04/web1_Hannah-Barga-HR.jpgHanna Barga lines a 2-run homer over the leftfield fence for Versailles in win over Lady Bolts. https://www.dailyadvocate.com/wp-content/uploads/sites/34/2019/04/web1_Hannah-Barga.jpgHanna Barga watches the ball sail over the leftfield fence to give the Lady Tigers a lead over Northmont. 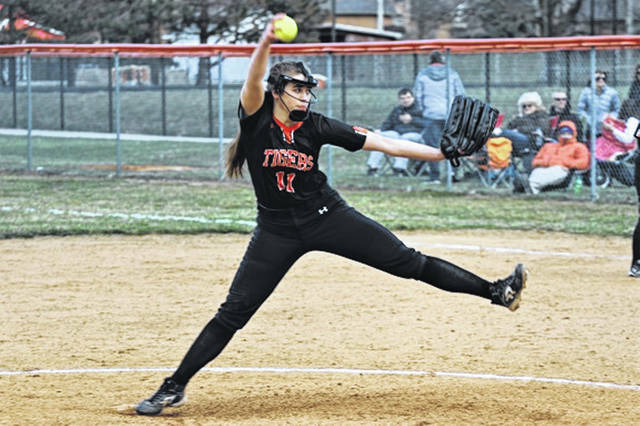 https://www.dailyadvocate.com/wp-content/uploads/sites/34/2019/04/web1_Lauren-Monnin.jpgLady Tigers Lauren Monnin picks up a win in relieve over Northmont.